I attended Urban Analytics Data Dive event on 25 and 26 July at the Alan Turing Institute in London. With a strong faith that data science can change the world, the Alan Turing Institute joined forces with the Office for National Statistics (ONS) Data Science Campus to host the first policy-focused Data Dive. The event brought together PhD Students, postdoctoral fellows and early career researchers in data science with an aim to design data science solutions to real world challenges. In two days, six teams tried to come up with innovative big data solutions to address the following three challenges: (1) where could we build more houses? (2) what are the benefits of access to green spaces? (3) can you develop novel early indicators of the health of the economy? In addition to already available Open Data sources, the teams were provided a wide range of additional data by the Satellite Applications Catapult, the Urban Big Data Centre and ONS. Also to help crunch the numbers, Microsoft provided each team resources on the Azure Cloud. I worked in a team tackling the challenge of “what are the benefits of access to green spaces?” I chose this because it aligns with my research around using data to influence local planning and advocating for healthier environments. As there is already a lot of literature on the health benefits of green spaces and we have a pretty good idea where green spaces are (courtesy of satellite imagery and a new datasets provided by Ordnance Survey), we decided to focus on how and who can access green spaces. Fortunately for me, we took Newcastle as our test case for figuring out these questions. We used datasets about green spaces and their entrances points and merged it with census data on commutes to work to figure out how likely people are to go through parks. Also we could say where would be the best entrance points to parks to increase their usage on commutes. We showed how green each area of the city is and developed a walking index (how likely people are to walk through parks) from each area. All of these and other resources for our team are available at https://turingchallenge.github.io/. This shows the power of data and how you can derive new interesting insights by merging different datasets rather than answering one specific question by polling citizens with surveys. As these insights are useful for policy makers, they could be equally useful for the people on the ground. Imagine an application which gives you alternative routes for commuting, cycling or running that utilises the most of green spaces. Also thinking about the issues of air pollution that the country is facing, we could equip people with knowledge on how to choose the healthier routes and alternative modes of transport. For example, by merging this data with air quality data from Urban Observatory. As a result, people would live a healthier life and this could save the NHS a lot of money. At the end of the second day, each team had to present back their ideas, methodology, developed tools and other findings in a 10 minute presentation which was judged by professionals from the field. I, and all the people at the event, were amazed with the results people came up with in two short days. It show what you can achieve with motivated and skilful people when you bring them together and provide them with data and resources. Hopefully these events encourage governments and other institutions to open up their data and invite people with skills to use it for public good #datascienceforpublicgood. Looking forward to new events and collaborations with The Alan Turing Institute and Data Science Campus. For more information please contact Aare Puussaar. Newcastle’s parks and allotments are facing big changes, but local people are being brought into the discussion. Open Lab is working with Newcastle City Council to hold workshops and online discussions that include residents, allotment holders, the business community, local charitable groups, friends of parks and other interested parties. These conversations are centred around what activities a charitable trust could support, where the money should come from, what role volunteers and communities should play, and how decisions should be made. The consultation comes after the council announced plans to transfer the city’s parks and allotments to a new charitable trust. Since 2010 the council’s parks budget has been cut by 91% and it is now looking for a new way to fund their maintenance and operation. In addition to the council’s own consultation, Open Lab are running workshops across the city, with a mix of morning and evening sessions, to allow as many people as possible to take part. The workshops are being complemented by Twitter discussions, hosted each Wednesday at 7pm by @NCLTalkParks using the hashtag #NewcastleParks. Each of the four hour-long debates will focus on a different question relating to the future of Newcastle’s parks. Open Lab’s consultation will run until 6 April, and more information can be found at the Let’s Talk Parks website. The council will use the ideas collected through the discussions and through its own consultation to develop a business case for transferring control of the parks to a charitable trust. Cllr Kim McGuinness, cabinet member for culture and communities at Newcastle City Council, said: “Open Lab at Newcastle University have come up with imaginative ways to deliver online material and informal face-to-face workshops that will help people think about the matters being raised. Technology and social media play a big part in Open Lab’s work – as they look to get people to think outside of the box, and express their views and thoughts about the prospects of a charitable trust. For more information, please contact Clara Crivellaro. Funding cuts – under the UK’s austerity measures – have put huge financial pressure on many areas of local government service provision. One such service is local parks, which have seen their budgets slashed in an effort to minimise the impact on other areas. In practice, this means that fewer full-time staff are available to local parks, increasing their reliance on volunteers from local communities. Public concern has risen about the conditions of the Newcastle’s parks and their future. This has prompted the Council to look for and consider creative solutions for their funding and maintenance, with special consideration given to the opportunities they offer for social activities and the benefits they provide for health and wellbeing. The extent of the threat, and public concern for local parks, has led the Communities and Local Government Committee to launch an inquiry into public parks to examine the impact of reduced local authority budgets on parks serivices. It is in this context that, since November 2015, Open Lab has been collaborating with Newcastle park services, park rangers, friends of parks and volunteers’ groups to explore the potential of digital technology to support the delivery of park services. The ongoing project has developed through a series of engagements and the development of Parks2026—a board game that aims to support different stakeholders (rangers, volunteers, friends of parks, park services officers), examine possible futures scenarios and consider creatively and collaboratively possible solutions for the multifaceted aspects at play in the running of park services. Concurrently Open Lab has also begun to explore how digital technologies might support civic learning activities in parks, which have also been significantly reduced due to the cuts. Open Lab’s involvement with Newcastle Park Services and volunteers’ groups will continue over the next few months, exploring how design tools and technology can support the examination and decision-making processes towards creative and practical solutions to keep the city’s parks a public asset we can all enjoy and care for. For more information please contact Clara Crivellaro. For my Digital Civics MRes project I created Park:Learn, a mobile application designed to enable situated mobile learning within local parks. Parks have suffered huge funding cuts due to their low priority within local authorities’ budgets: in 2014, the Heritage Lottery fund found that 86% of park managers have seen their funding slashed since 2010. This has especially affected the parks’ abilities to function as a learning resource, with many parks introducing fees for school trips. We found further evidence of this when we visited some of the parks in the Newcastle area. Due to a loss of funding Jesmond Dene no longer has a dedicated education officer, with many of the existing educational materials going unused as a result. The issue has been further compounded by schools also suffering a series of yearly budget cuts. We held a series of exploratory workshops and visits to the parks in the Newcastle area in order to learn more about the issue, its causes and effects. 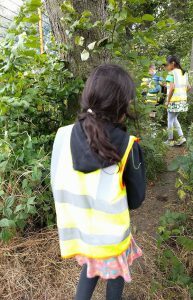 We found that park rangers and teachers alike were very keen on holding more outdoor learning activities in their local parks. Teachers in particular noted that many of the obstacles to doing so (besides budgetary issues) were related to fitting the sessions into their scheme of work and being able to justify them afterwards with evidence of the children’s learning. In response, I developed a Park:Learn prototype. This mobile learning application allows for the completion of park-based learning activities, utilising the capabilities of the user’s device, the park environment and the joint expertise of teachers and experts within the local community, such as the rangers. The learning activities were created through the suggestions given by the teachers and rangers, and are made up of tasks involving photography, audio and video recording, drawing, typing, map-reading and location hunting via GPS. We piloted the application in Exhibition Park, with 23 children aged 4-12. Over the course of the session over 160 photos were taken, alongside David Attenborough-style video documentaries and drawings. The app was extremely popular with the children, who said that the creative acts of taking photographs and recording video made learning subjects like habitats “more interesting and exciting”. They also claimed with certainty that they would enjoy using a tool like this in future school trips. However, this pilot prototype was just that – a pilot for a bigger, more impactful project. In future work we aim to be able to allow teachers and community experts to create and share these activities in the application, allowing for the creation of a sustainable, community-driven platform for outdoor learning activities. Ideally, we eventually want children to be able to create these activities for their peers, as creation is often regarded as a path towards deep learning reflection. We hope that this will lead to local parks being better utilised as educational resources and, as a result, increase their perceived value. For more information please contact Dan Richardson.